We have all been told time and again that change is good. Although there may be initial anxiety about an unknown future brought on by our comfort with the status quo, more often than not change does result in making things better. After all, who doesn’t want to be innovative? The impetus for making changes to applications and the motivation for overcoming challenges brought on by these efforts can be singular or multifaceted. Annual cost reduction goals, initiatives to boost production volume and/or quality, increased competition, evolving customer preferences, and the constant need for business growth are just a few of the many reasons product designers and engineers are able to retain their jobs developing better applications. Central to all manufacturing processes are our material choices and the methods used to form those materials into applications. Manufacturing is capital, labor, and time intensive, factors that have great impact on appliction cost and business profitability. The next time you’re challenged with change, rethink not only your product’s features and capabilities, but also the manufacturing processes used to produce them by considering material substitution from metals to reinforced plastics. Perhaps you’re already deploying plastics for some application components, from simple operation knobs to more complex exterior housings and are familiar with their benefits, but feel you’ve reached the limit of these material’s capabilities. If so, chances are you’re just not familiar enough with the capabilities of the full range of these versatile materials. If you’re a traditional materials person, it can be hard to wrap your head around plastics, after all they are matter in completely different states. Metals are highly organized crystalline solids that have consistent and predictable performance. On the other hand, plastics are non-Newtonian, viscoelastic materials in amorphous or semi-crystalline states consisting of long entangled polymer chains whose performance can be relative to environmental temperature and time conditions co-dependent on varying levels of stress exposure. Plus there are so many plastic materials – over 40 different polymer matrices and each has a wide variety of grades formulated to tailor their properties for different usage situations – you almost need to be part plastics engineer to make heads or tails of them all. 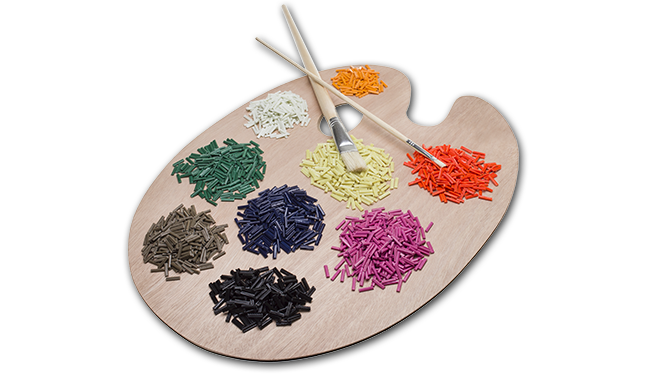 Add in compounds that combine additives with the polymer matrix and, according to the online materials database MatWeb.com, there are over 80,000 different plastic materials to choose from. Choosing the right matrix polymer based on your application’s performance requirements and usage conditions is the subject of other articles. Instead, we want to build your confidence that plastics can legitimately be used as an alternative to metals in applications that have structural performance requirements. Most applications are not skyscrapers that require high strength steel to resist hurricanes or earthquakes. Hand-held to counter top sized applications regularly have lower performance requirements well within the threshold of plastics. In some cases, simple familiarity with a particular material medium may be leading you to specify an over-engineered solution that consumes valuable labor and time resources. Among the plastic compounds are fiber-reinforced plastics, these come in two main variants with either short fiber reinforcement made with chopped fiber or long fiber reinforcement made from continuous fiber. Fiber reinforcement can provide a tremendous amount of structural integrity and raise the tensile strength of the entry-level engineering polymer nylon 6/6 (polyamide 6/6) six times from 8,000 psi (55 MPa) up to 48,000 psi (331 MPa). This puts plastic strength in the same performance realm as metals like die-cast magnesium and aluminum. 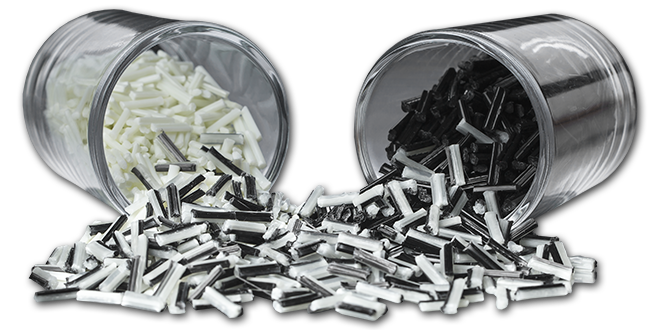 Of the two types of fiber-reinforced plastics, short fiber filled compounds are best at providing low to moderate levels of performance enhancement while long fiber-reinforced composites are better at providing moderate to high levels of performance making them well suited for most metal replacement situations. 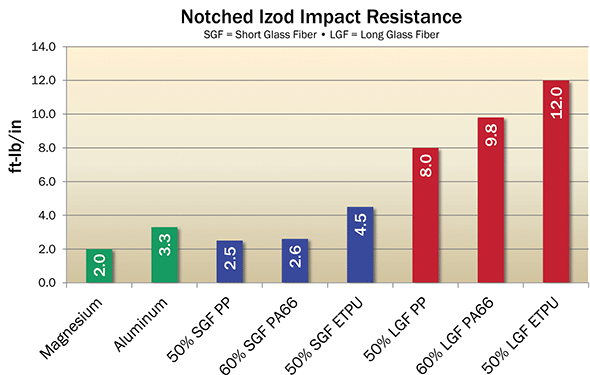 Additionally, long fiber-reinforced composites stand out from other methods of reinforcing plastics because they provide increased toughness commonly measured through notched Izod impact resistance. Longer filaments of fiber form a more skeletal-like structure inside molded components augmenting energy dissipation. Having a robust, intertwined network of fibers enhances material resistance to crack formation and propagation upon impact. If catastrophic failure does occur, fiber-reinforcement lessens generation of debris like shrapnel. Plastics ductility is also an advantage over metals that enables them to absorb higher impact stresses and resist permanent deformation or denting at impact locations. Ductility also gives plastics excellent cyclical fatigue endurance. With plastics strong enough to go head-to-head with metals, what about their modulus or stiffness? 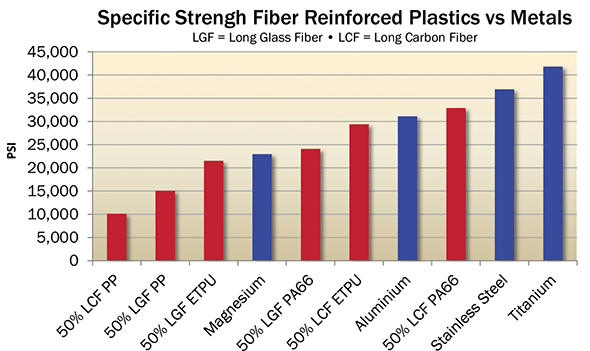 Including fiber reinforcement boosts plastic modulus to levels higher than un-reinforced materials, but they still fall short of the high stiffness of metals. In the case of modulus, plastic data sheets are deceiving as it’s possible to produce plastic components that are far stiffer than data sheet values. Stiffness achievable with plastics is very dependent on component design, which should include elements that enhance stiffness in key areas to compensate for shortfalls in material properties. Judicious use of reinforcing elements such as ribs and gussets in designs are crucial to stiffening up an injection molded plastic component. Adding intricate details like these to plastic articles doesn’t increase production costs like it does with other material forming mediums because plastic molds are only machined once and then are able to produce thousands, if not millions, of identical components. Self-reinforcing rib and gusset features in plastic product designs also help promote dimensional stability and ease the holding of tight tolerances. Warp distortion can be caused by differential shrinkage as areas of plastic components cool at different rates after molding, fiber-reinforced materials shrink less than unfilled plastics but have anisotropic behavior. With fiber-reinforced plastics it is important to understand that thicker wall sections do not necessarily result in stronger and stiffer components. Unlike with metals, beefing up wall sections to obtain a safety factor is not good practice. When a mold is filled with molten plastic material, fibers embedded in the plastic have a tendency to align in the direction of polymer flow through the mold. Thinner wall sections in the 0.080 to 0.160 in (2 to 4 mm) range actually help promote more fiber alignment creating stronger parts, which as a bonus utilize less material. Fiber orientation is a key consideration when designing a component that will be molded with a fiber-reinforced material. Aligned fibers are better able to transfer stress laterally over a larger area of the part and optimum performance is achieved when fiber alignment is perpendicular to applied forces. Good component design should also take into consideration mold filling gate locations to maximize fiber alignment as well as knit or weld lines location where plastic flow fronts meet as the material fills the mold to eliminate potential weaknesses in key stress areas. Simply switching materials and keeping component designs identical is rarely successful when transitioning from metal to plastic. Every material medium has inherent advantages and limitations and good product design takes these factors into consideration instead of trying to handicap the likelihood of success by minimizing change. Metals may seem comfortable and safe because we have a long history of using them that stretches back hundreds, if not thousands, of years and many of their limitations were learned long ago and are now routinely accounted for in current materials and designs. Plastics, on the other hand, have a much shorter history, and to some degree, we are still learning how to use them effectively. Luckily, the information age is upon us and a number of computerized simulation tools have been developed that enable the modeling and evaluation of materials and designs before ever reaching the prototype or production stages. These capabilities greatly eliminate risk associated with material conversions and should give you added assurance of success. Computerized mold filling analysis can test the manufacturability of design options and finite element analysis (FEA) can simulate the ability of different material options to meet real world performance criteria you specify. One characteristic of plastics that has limited their use in structural applications is cold flow deformation or a creep phenomenon when subjected to constant stress. Under constant load, plastics behave as if they are operating at elevated temperatures and a reduction in performance occurs that can result in creep if needed load-carrying ability is not properly accounted for in material selection and product design. 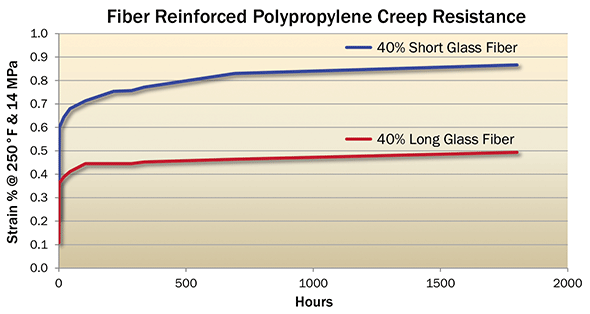 Fiber-reinforced plastics are less susceptible to creep because of their higher stiffness and strength capabilities. Knowing potential loads that a component will be subjected to makes it possible to predict plastic creep performance through analysis of dimensional changes over time while under load. Most plastic data is captured at room temperature (73°F or 23°C) and one must reduce their performance expectations from what they read on data sheets if they have an application that will be operating outside the traditional temperature comfort zone for humans. The amount of performance loss is dependent on the polymer you choose to work with and its specific morphology, either amorphous or semi-crystalline, and its respective Tg (glass transition temperature) or melting point. As with any product subjected to stress forces, a reasonable safety factor should be included as part of your analysis and every attempt should be made to learn in the lab and not in the field. Plastics exist with capabilities that go well beyond just holding a straightforward formed shape, such as for an exterior housing – internal load bearing structural elements of many applications that have long used metal are ripe for replacement with plastics to allow simplification of your manufacturing processes and improve in your application’s functionality. To consider converting a metal component to plastic you must have a clear understanding of your application’s usage conditions to derive accurate specifications to which a replacement material must conform. Explore new design options and their manufacturability, review material specifications in detail, and conduct as many CAE simulations as are needed to ensure you are making the right choices. Lastly, determine the benefits that will result from conversion for your application, its users, and most importantly your company’s bottom line. The motivation to undertake every conversion is different. When trying to streamline a manufacturing process it’s hard to beat the efficiency of injection molding plastic components. It’s a single-step process that transforms pellets of plastic raw material into 3-D net shape articles in short intervals at high volumes with consistent quality. Compared to metal fabrication techniques, such as die-casting or machining, injection molding greatly reduces two key manufacturing elements: labor and time. One of the driving factors why product designers and engineers consider switching to plastics from traditional metal materials is for weight savings. Most applications require some level of portability or frequent handling and lightweighting reduces user fatigue thereby increasing functionality. Additionally, lower weight products cut shipping expenses. With bulk densities ranging from 0.8 to 1.9 g/cm3 plastics are half the weight of aluminum and less than one quarter the weight of steel. In regard to plastics, the concept of design freedom incorporates several sub-topics. Complex Geometry – Gain more versatility in your designs by easily forming intricate 3-D components that have complex geometries. Features that would be cost prohibitive to produce using other forming mediums are easily achieved in plastics. Part Consolidation – The ability to produce complex geometries lends itself to consolidation of multiple 2-D pieces into single components. Part consolidation reduces secondary assembly operations that consume valuable labor and time resources. Improved Functionality – More organic designs allow for integration of functions and ergonomic considerations that wouldn’t be practical in other material mediums which helps differentiate your products from competitors. A lot of labor and time resources are expended on secondary operations in manufacturing processes. Assembling multiple pieces by welding or fastening along with getting parts to finished specification with polishing or painting (which adds environmental concerns with VOC emissions) are resource consuming steps. Having the ability to produce finished quality net shapes in a single step can eliminate or reduce resources consumed by secondary operations. Too often people look only at the cost of raw materials on a per pound or kilogram basis and dismiss alternatives as not being economically viable. One needs to consider the entire system cost of forming materials into finished components. Cost savings from single step forming, elimination of secondary processes, and lighter materials having more cubic volume are factors in plastics favor. In addition to increasing structural performance with fiber reinforcement, other additives can be compounded with polymer matrices to add more functional performance. Molded-in solid color enhances appearance, internal lubrication reduces maintenance, flammability resistance for UL94 safety compliance, or incorporating ESD and anti-static properties allow creation of truly multifunctional materials.